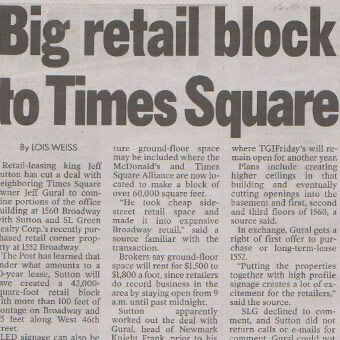 Big retail block to Times Square, by Lois Weiss. Retail-leasing king Jeff Sutton has cut a deal with neighboring Times Square owner Jeff Gural to combine portions of the office building at 1560 Broadway with Sutton and SL Green Realty Corp.’s recently purchased retail corner property at 1552 Broadway. The Post has learned that under what amounts to a 70-year lease, Sutton will have created a 42,000-square-foot retail block with more than 100 feet of frontage on Broadway and 175 feet along West 46th Street. LED signage can also be splashed across the façades. Documents show that future ground-floor space may be included where the McDonald’s and Times Square Alliance are now located to make a block of over 60,000 square feet. “He took cheap side-street retail space and made it into expensive Broadway retail,” said a source familiar with the transaction. Brokers say ground-floor space will rent for $1,500 to $1,800 a foot, since retailers do record business in the area by staying open from 9 a.m. until past midnight. Sutton apparently worked out the deal with Gural, head of Newmark Knight Frank, prior to his preemptive $136.55 million purchase of the landmarked 1552 Broadway, where T.G.I. Friday’s will remain open for another year. Plans include creating higher ceilings in that building and eventually cutting openings into the basement and first, second and third floors of 1560, a source said. In exchange, Gural gets a right of first offer to purchase or long-term-lease 1552. “Putting the properties together with high profile signage creates a lot of excitement for the retailers,” said the source. SLG declined to comment, and Sutton did not return calls or e-mails for comment. Gural could not be reached.